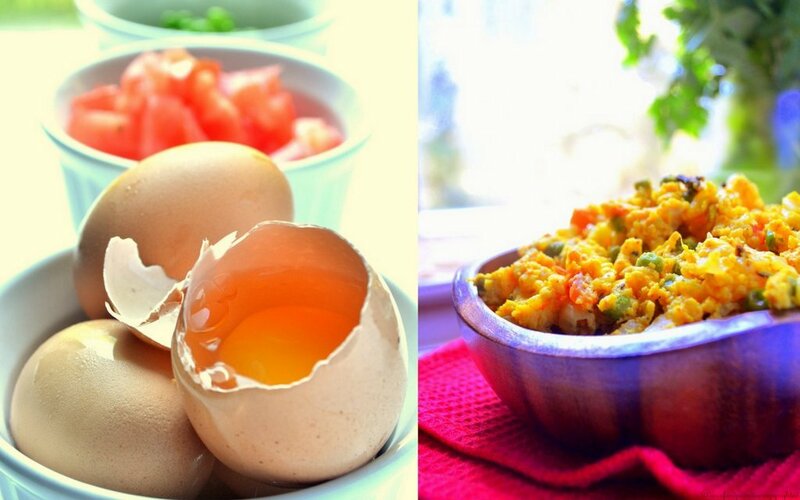 Egg Bhurji/Spiced-up Scrambled Eggs | The Flavor Nook! It’s again that day of the week when I don’t feel like spending much time in the kitchen (I confess….this happens at-least once every week). So, I lean over the refrigerator door and scan over, stopping by every veggie and thinking ‘Anything quick I can make out of it?’. And after several nah, nah’s my eyes stare at some cutsy eggs (which are by the way labelled ‘extra-large’ on the package…..but trust me they are hardly even closer to ‘large’ size) and then the rambling begins……. Omelette with roti? May be! Good enough for me….but hubby prefers rice! sooo Egg Masala/Guddu Pulusu? too lazy to use a blender! How about Egg Bhurji? Perfect! Great with rotis (I try to replace rice with rotis at-least few times a week to cut-down on meal-portion and calories) and equally good with rice and yesterday’s Tomato rasam! So, Egg Bhurji it is! 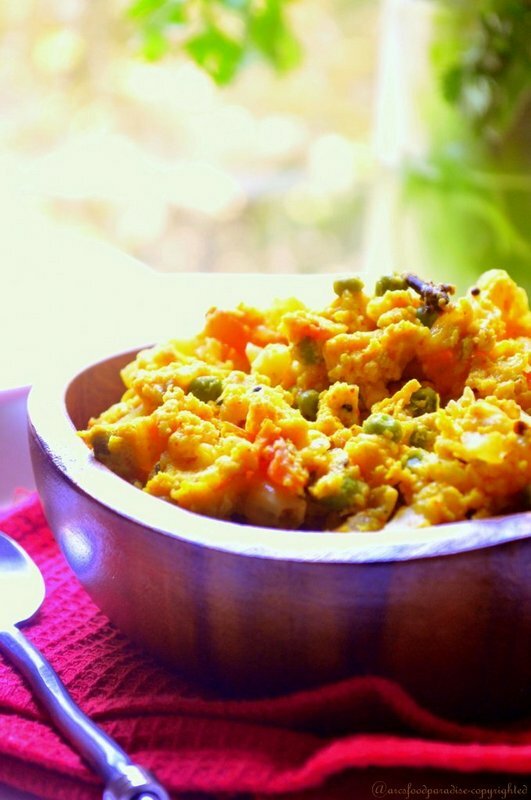 For a quick intro, ‘Egg Bhurji’ is a very common side-dish in India. 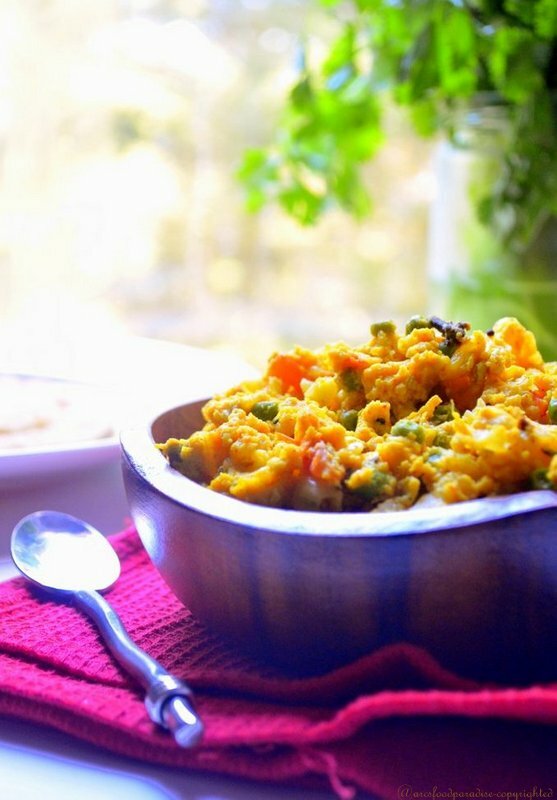 You could call it a fancied-spiced-up version of scrambled eggs. It is usually made by cooking eggs with sauteed onions and spices. But, you could also add veggies like carrots, green peas, bell peppers if you like which makes it quite a versatile dish. Simply roll it up in a roti and have as a wrap or sandwich it in between bread slices for a filling breakfast! I’m pretty pleased to discover this page. I need to to thank you for your time due to this fantastic read!! I definitely loved every little bit of it and i also have you book marked to check out new information on your site. It’s one of my favourite. It looks more delicious here! thank-you!!! I love how simple it is to make!